Click to go to a video of the Final on You Tube kindly provided by Simon Flynn. Many thanks to Simon Flynn for all the photos. Another year for this tournament and once again most of the matches were tight hard fought games with the handicaps proving to be correct in most cases. In the first group Jill Newby and Chris Davies found the handicap too much to give to the local players and it took them some time to adjust to the court although Irina Dulbish and Mark Gillespie (a home player several years ago) did not have the same problem and after losing their first match went on to come 2nd in the group. Local pair Jackie Carter and Jerry Way won all their matches to come 1st and progress through to the quarter finals. The second group was won by Katie Leppard and Mike Steward (who unfortunately was not able to play on the Sunday) without losing a game and the local pair of Sue Bicheno and Chris Halliwell (our sponsor) came a successful 2nd to go through to the next day. The third group was a very hard fought one with no-one winning all their matches and in fact the winners were decided by a count back for points against. Lucy Hutchinson and Peter Swiss finally finished first with Fiona and Tony Harrison (last year’s winners) coming 2nd with each pair winning at least one match. Finally the fourth group which ended up with the lower handicap players all fighting hard and again no-one winning all their matches. In this group we had the first pro playing with Chris Chapman partnering Harriet Ingham who I think at times wondered what she was doing on court in such an exalted group. Although they lost their first match to Alex Garside and Spencer Davies, Chris and Harriet came 2nd in the group just losing out to Sue Haswell and Simon Talbot-Williams. The quarter finals started with Jackie and Jerry playing Harriet and Chris off the largest handicap of the tournament. 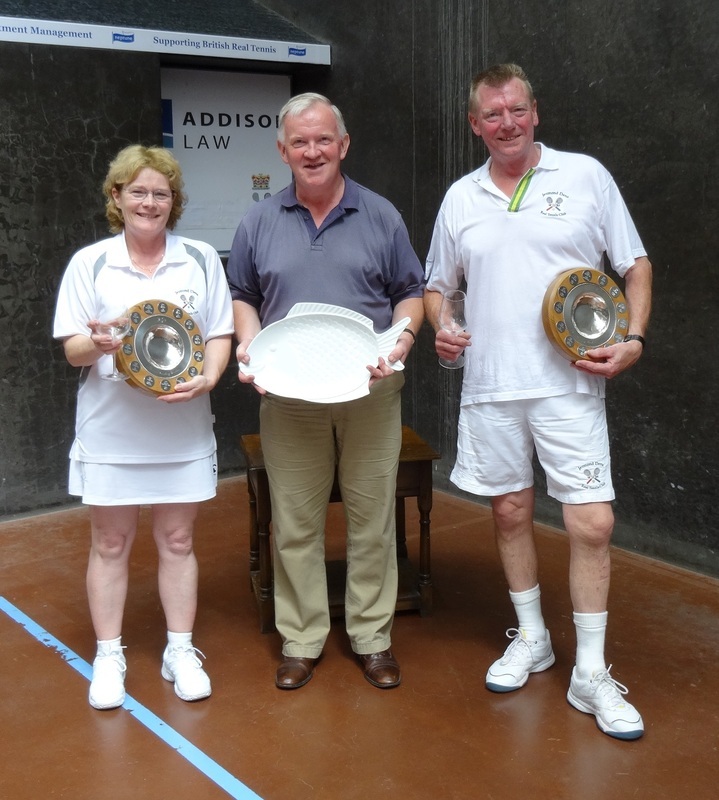 Having to give points as well as one serve, ban the tambour and chases worse than 3&4 was mind blowing for Harriet and it proved the same at first for Jackie and Jerry who hit several shots that were going to lose 3&4 but towards the end of the game they learnt to leave them. Harriet did really well returning the ball from the hazard end to better than 3&4 every time and she only lost one shot at 5-5 for them to go 40 love down but her partner Chris played the final point that just hit the top of the net for them to lose a very tight match. In the next match the Harrisons proved too strong for Katie and Neil Paterson (who stepped in at the last minute) and they won 6/0 very quickly. The 3rd match saw Sue and Chris start off in fine form going to 4-0 against Lucy and Peter who soon found their game again and got back to 4-4. The rest of the match was very close with Sue and Chris finally just getting through 6-5. The final match in the quarters was again close starting off even all the way to 3-3 where some good volleys saw Irina and Mark go 5-3. Then Sue and Simon started to serve well and managed to get back to 5-5 only for Irina and Mark to win 6-5. The first semi saw Fiona and Tony against Jackie and Jerry and again it was very close until at 4-4 Fiona and Tony finally won through to take the match and once again get to the final. The second semi proved a much more one sided affair with Irina and Mark being too steady for Sue and Chris who lost 6-0 quite quickly. That brought Fiona and Tony against Irina and Mark who started in fine form getting to 5-1 with very few problems. Then things started to turn and Fiona and Tony fought back to get on even ground at 5-5, they then went on to be 6-5 but after some very impressive volley’s from Irina particularly at 40-all the match went to 6-6. The next game went to 40-all but Fiona and Tony took the last point and then went on to win the match 8-6. This tournament proves to be very popular with the players and it would be great to see more taking part next year. Seacourt in the sun is a great place to be. Thanks must go to Danny for marking, and to Darren Long who came over on Saturday morning to cover for Adam who was on holiday, who before going away made sure that we got the handicaps and playing order correct. Thanks to Addison Law for sponsoring the tournament and to Alex and Viv for organizing it. Also to those of you who came to play.